The Augustus is a robust tactical style folder from Canadian knifemaker Kirby Lambert. Features Ivory Paper Micarta scales and Moku-Ti bolsters. 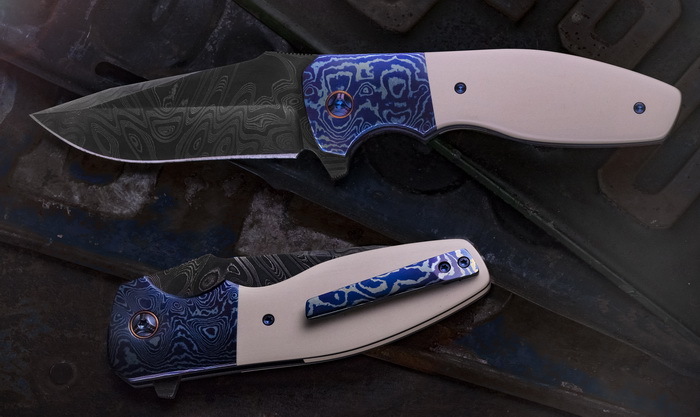 The anodized Titanium liners form a beastly liner lock to retain the classic clip point blade of Chad Nichols Ant Farm pattern Stainless Damascus. Silky smooth deployment via the flipper. A tip-up, sculpted Moku-Ti pocket clip is fitted. The Augustus features machined titanium pivot screws (dual colour anodized), machined paper Micarta back spacer) and dual colour anodized screws. The pivot has a Copper collar. Includes a nylon zipper pouch with Kirby's signature. I am constantly striving for perfection in creating, for what I feel is one of the highest quality knives on the market today.